Please refer to our stock # 7072 when inquiring. Large iron and hakuji glazed chawan by Mashiko potter; Nishida Shinya. Boldly glazed chawan with vivid deep crimson and plum flashes running through the glaze all on a earth tone stoneware clay body. This chawan is in perfect condition and measures 5.75" X 3" and comes complete with its signed box. The box has an exhibition number on it, so I am assuming this is an exhibition level bowl. 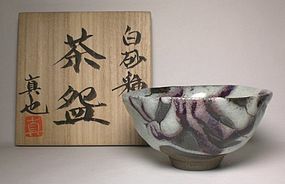 This chawan shows the influences of teacher, Shimizu Uichi (Ningen Kokuho) as well as fellow student Ikai Yuichi and is an excellent opportunity to get an exhibition grade chawan by this artist without having to go through a Japanese show lottery to buy a piece.